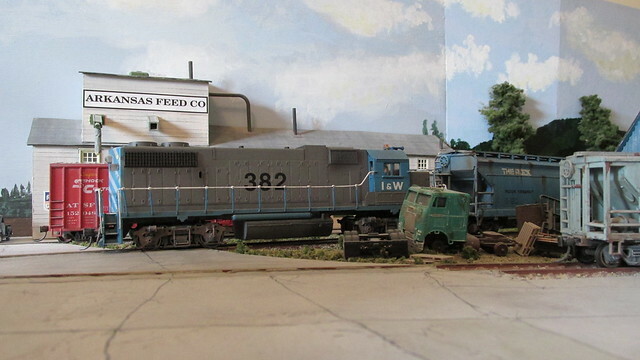 While the I&W geep crew are having a break that morning TVRR Alco S2 arrives with a car of fuel oil to fill up the tank at the basic facilities found at Benson. 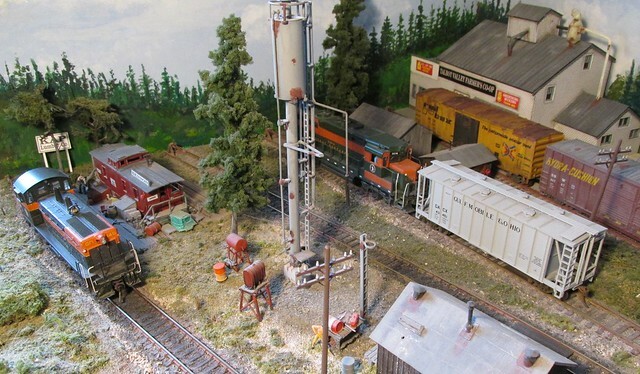 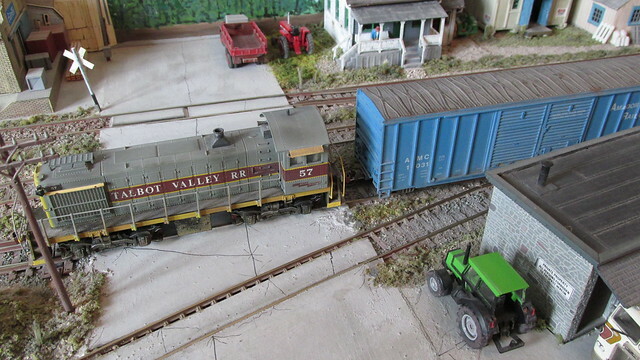 She spots the car in the flour mill headshunt temporarily because the I&W geep that brought in the pulpwood cars earlier in the day is standing on the fuel track next to the tank. 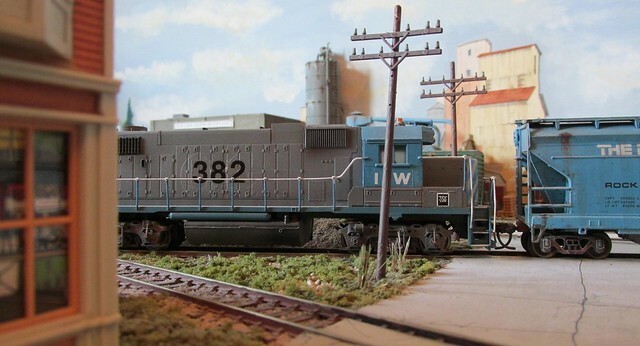 Sorry about this, still getting used to Flickr. 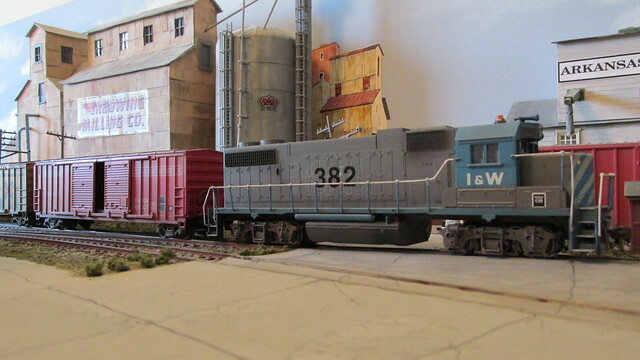 When the I&W geep leaves to make up its train for the pulp mill at Hodge LA, the Alco backs out with the fuel car and runs around it in the loop. 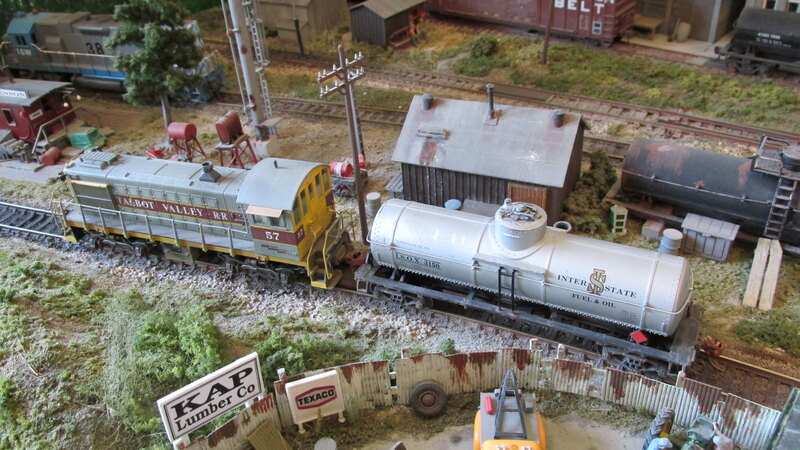 It is now in a position to push the car back next to the tank for the transfer of fuel to take place. 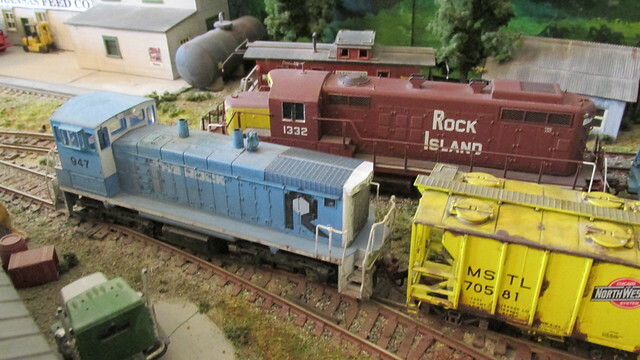 While the fuel is being transferred from the car to the tank the Alco heads down to the east yard to get details of his next job from the yardmaster. 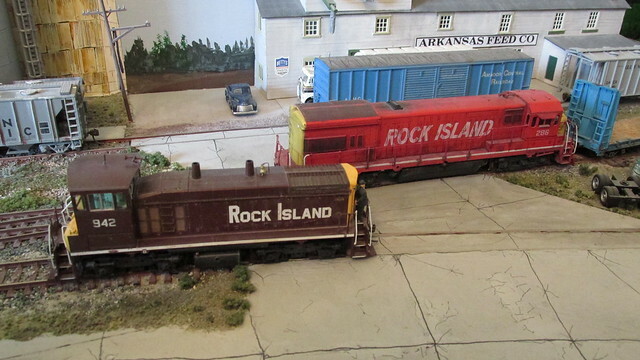 The crew of the Alco are told to pick up a boxcar loaded with bagged chicken feed for a farm some distance away. 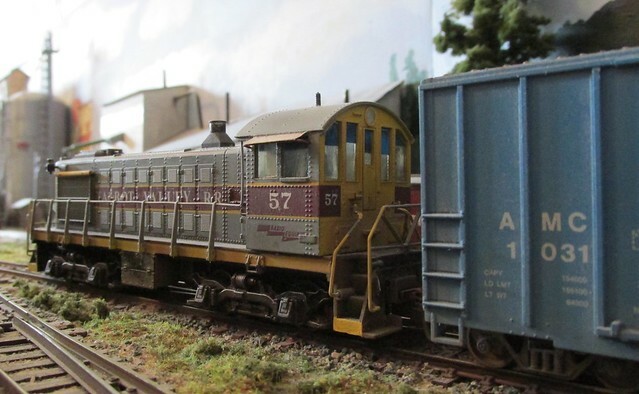 The farm is situated on a trailing spur from the I&W main line to Rosston, so it won’t take long to uncouple the car and back it into the spur. 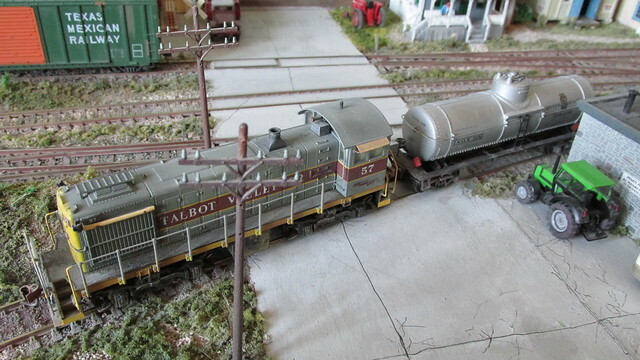 They can also return the now empty fuel oil car at the same time to save another working. 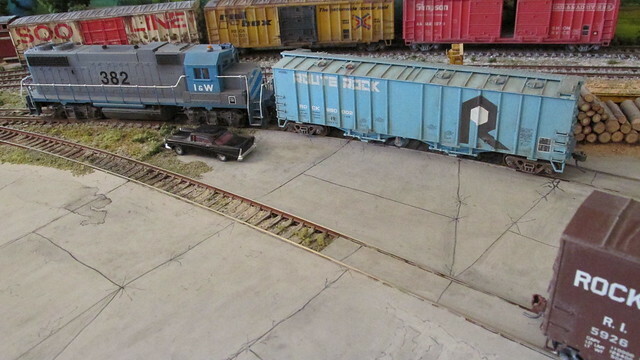 Arkansas Feeds is situated at the end of a long track at the back that has other industries on it, so it means extra work clearing the headshunt to enable the removing of the box car full of feed. 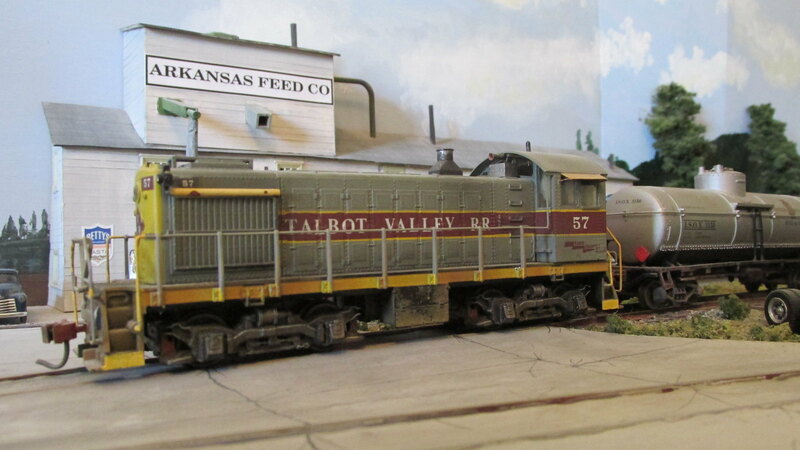 This adds a little operational interest. 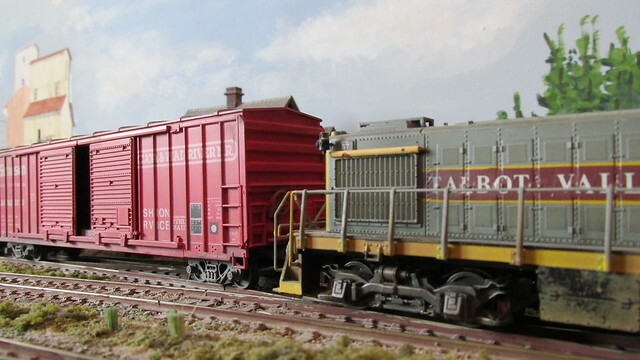 Here we see the Alco clearing the long siding next to the Redwing Milling elevator to collect the box car of feed from Arkansas Feeds. 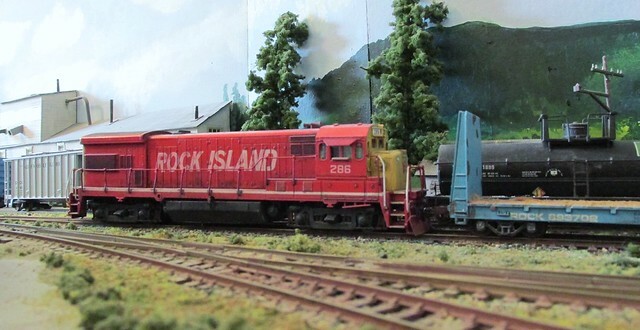 Having got the box car of feed out and returned all the cars back in their original positions, the Alco makes up it small train. 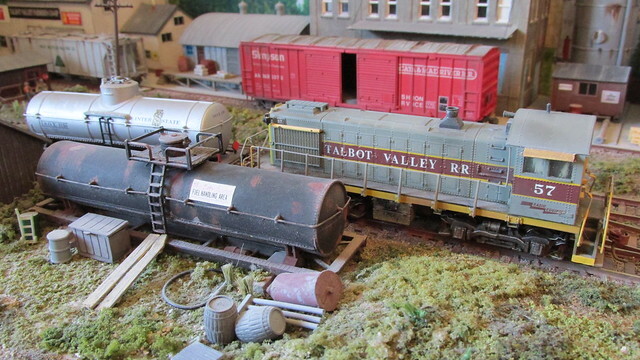 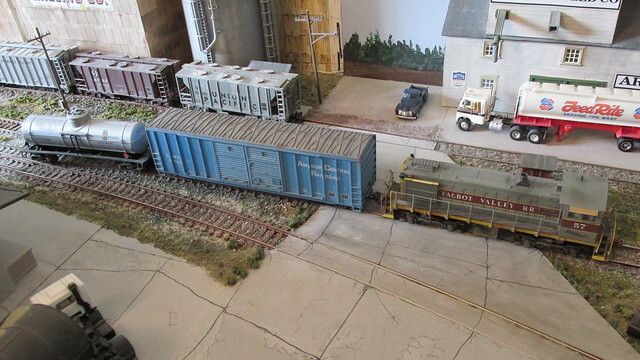 The box car of feed to the chicken farm and the empty fuel tank car back to Rosston. 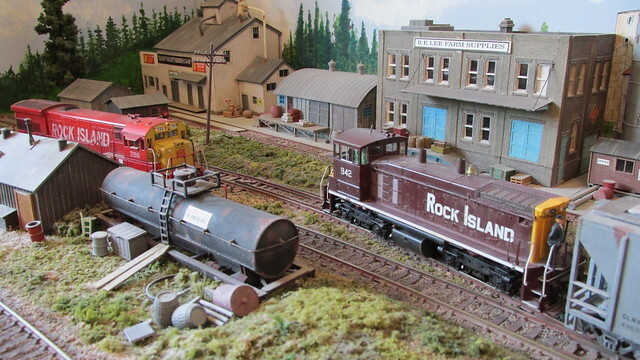 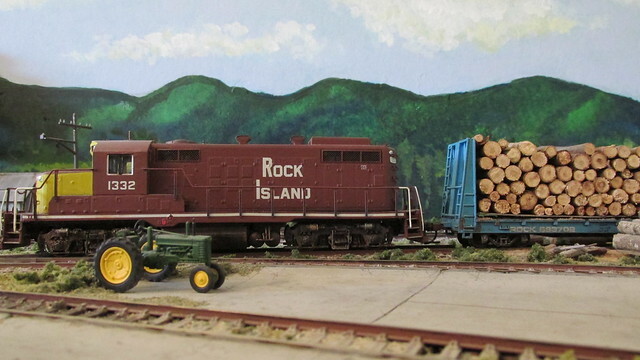 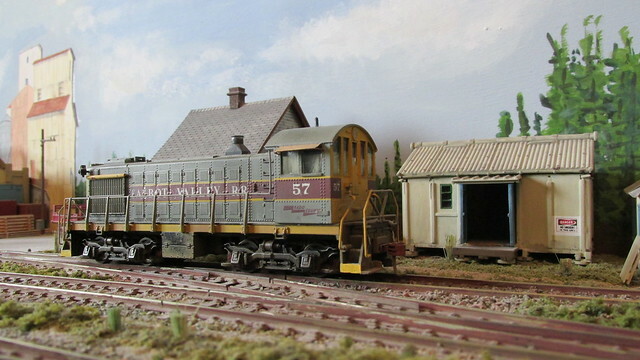 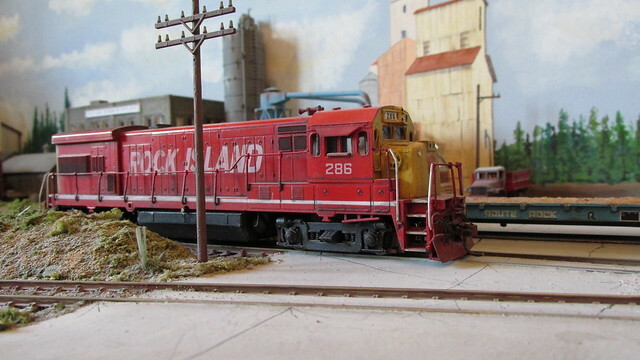 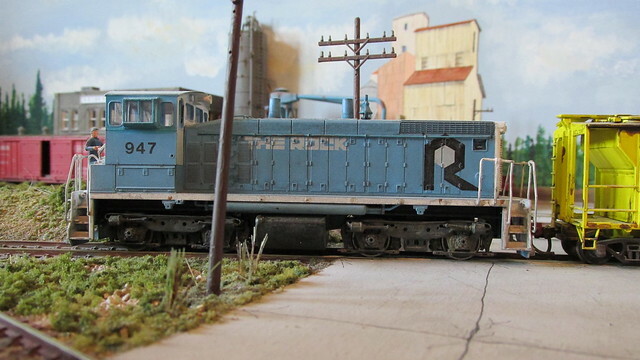 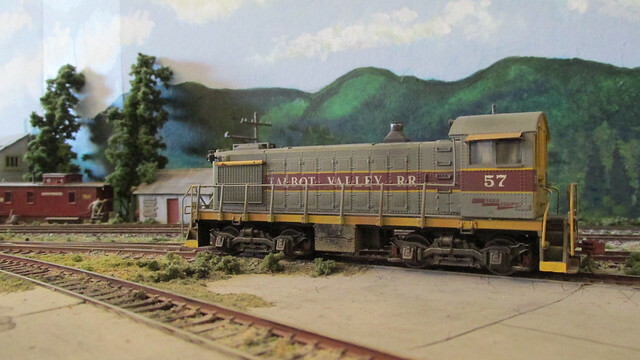 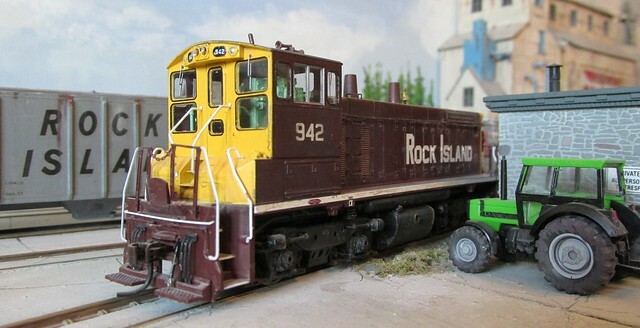 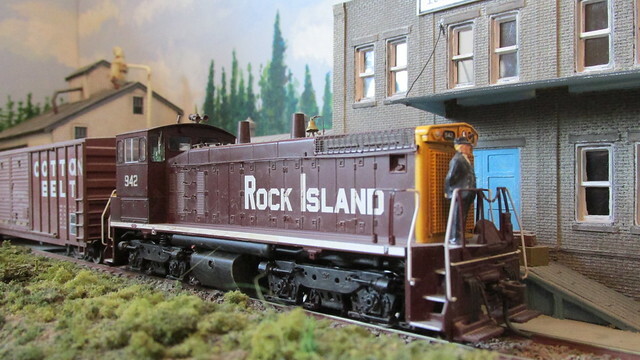 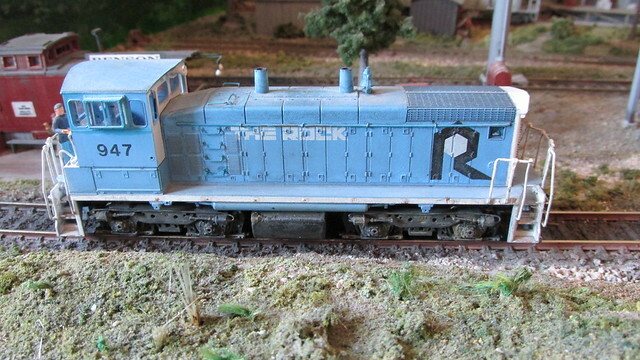 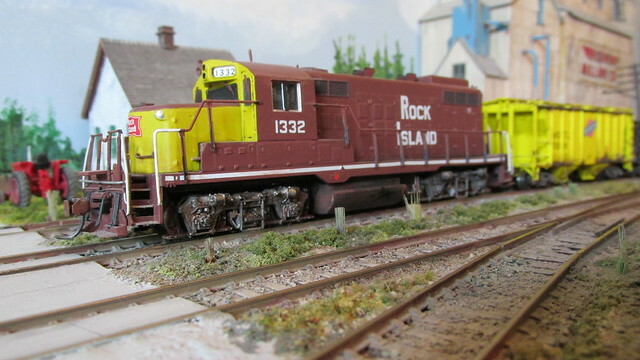 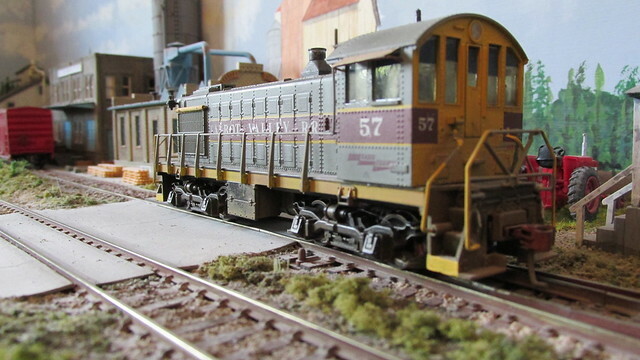 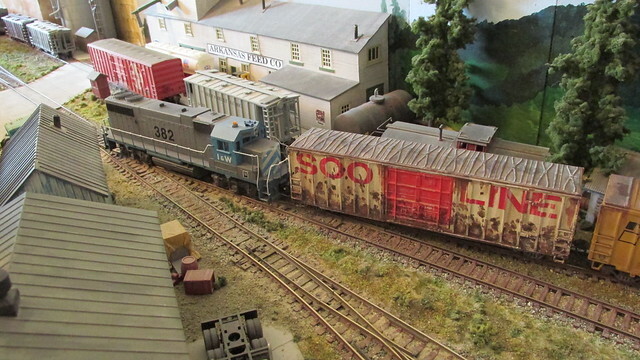 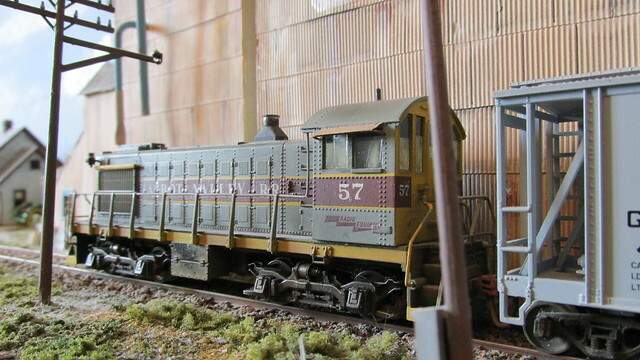 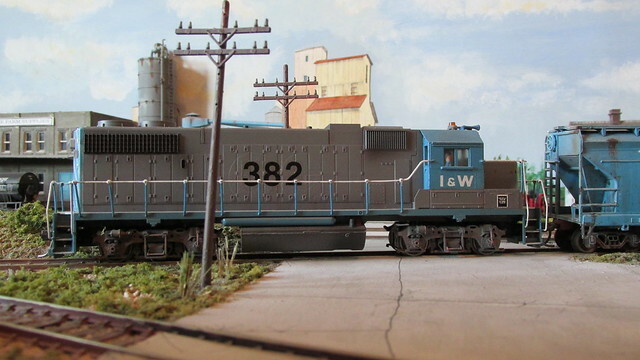 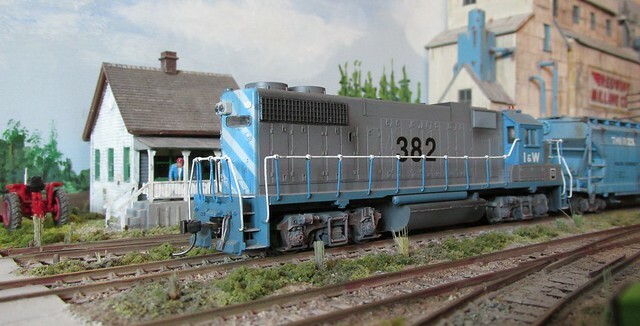 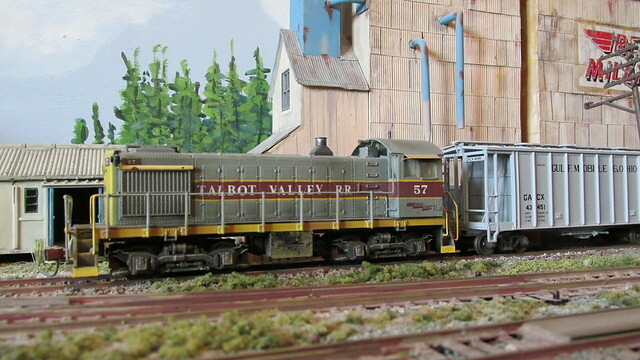 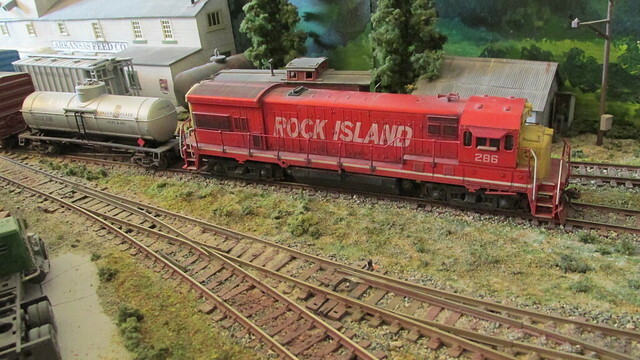 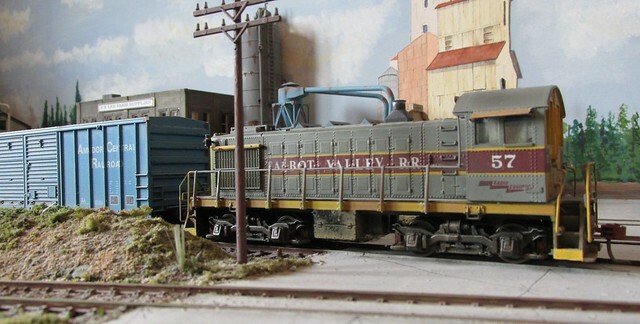 A Rock Island chop nose GP 9 arrives with a small train of loaded hoppers full of grain. 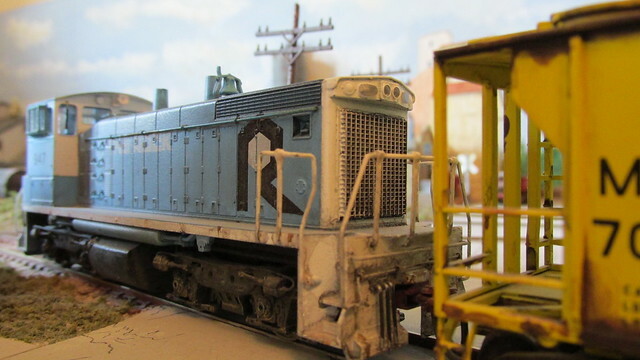 The CRP as a whole did not approve of chopped noses which were deemed to be an unnecessary expense even in 1975. 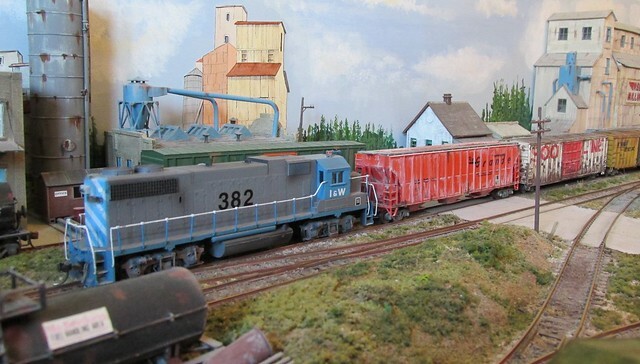 She leaves the cars in the loop and runs round the train then backs into the pulp wood loading siding and couples up to pulp wood cars that are still being loaded. 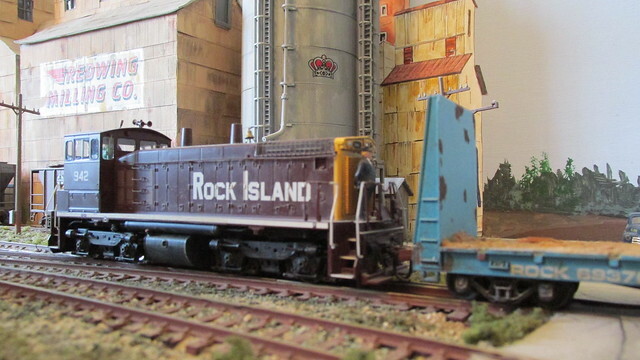 As the loading of the pulpwood is being completed the yard goat, a Rock Island SW1500 wearing a coat of bankruptcy blue spots the grain cars at the flour mill. 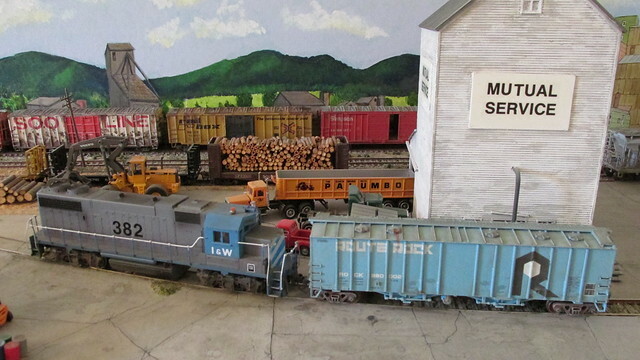 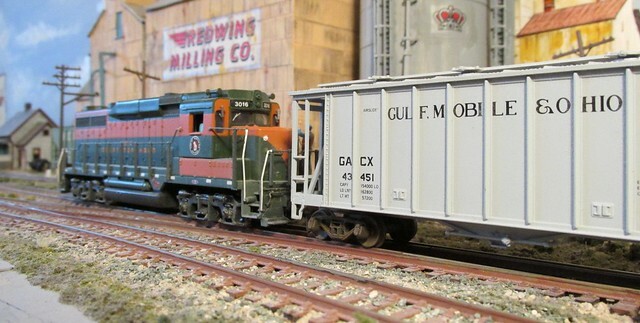 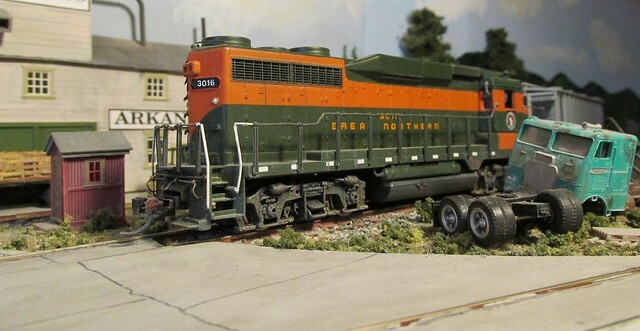 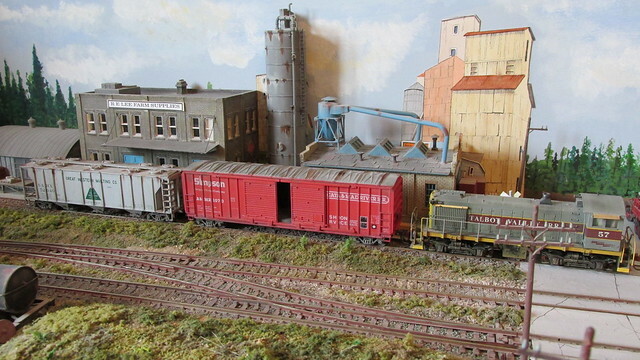 While the SW1500 spots the incoming grain cars the chop nosed jeep leaves with the loaded pulpwood cars for Louisiana and the Continental Can Mill. 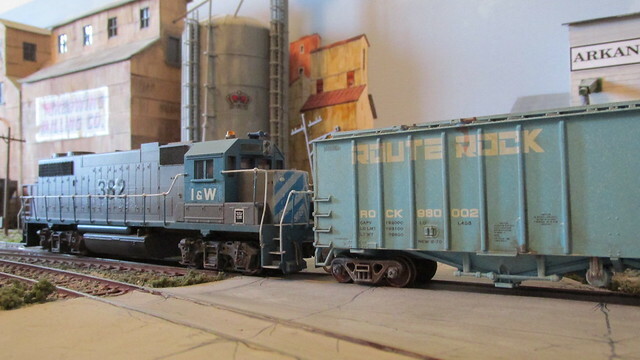 Having spotted the covered hoppers the crew of the SW1500 head back to the yardmaster’s grounded caboose to have a break for some beans and await their next assignment.